It was a high drama on Thursday in the Senate defecting senators from the Peoples Democratic Party (PDP) pushed stoutly to ensure that their intention already committed into writing was properly noted by the Senate. The senators, 11 in all, who had on Wednesday submitted their letter notifying the Senate of their defection from the ruling PDP to All Progressives Congress (APC) forcefully demanded that their letter should be read on the floor of the Senate. 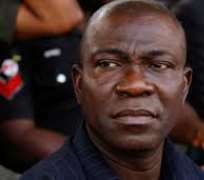 But the Deputy Senate President, Ike Ekweremadu, who presided in the absence of Senate President, David Mark, insisted that they should wait till Mark resumed on Tuesday since he was aware that the defectors had an agreement with him. The 11 lawmakers submitted their letter of 'notification of change of political party' to Mark. They expected Mark to treat the letter by reading it but for undisclosed reasons it was not read. Senator Abubakar Bukola Saraki (Kwara Central) who was said to have been unsettled by the antics of the Senate leadership raised a Point of Order to enforce his privilege by calling attention to the letter. 'So I felt that it was necessary for me to bring to your attention that the letter has not yet been read,' he said. Saraki, who appeared not to be satisfied with Ekweremadu's response thundered: 'That is not the case, sir. I submitted the letter yesterday (Wednesday) and he (Mark) indicated the intention that he would like to meet with senators. According to the report, that the Standing Rules of the Senate bar the senate president from mentioning any matter that is already in the court as this would amount to sub- judice. He said Order 53(5) states that 'if in the opinion of the senate president any matter is already in court, it will be considered sub judice and shall not be mentioned on the floor'. This rule, the source explained, bars the senate president or whoever is presiding in his stead from bringing up matters already in a court of competent jurisdiction. He added that even the defecting senators had referred to this standing rule of the Senate in their first letter to Mark last week, which indicated that they were aware the senate president's hands would be tied. It was for this reason, he explained, that Mark and Ekweremadu have refused to read the letter. Besides, the source said the PDP is also confident that it has a solid case against the defecting lawmakers and would most likely win its case against them at the courts, as the constitution is very clear that a lawmaker can only retain his seat when a party is factionalised. 'For this reason, it has been waiting for the letter of the defecting senators to be read on the floor of the Senate, following which PDP senators would immediately pounce and raise a point of order citing Order 53(5) notifying the senate president or his deputy that the Standing Rules of the Senate have been contravened. 'In the light of this contravention, the party could push for the defecting senators to lose their seats,' the source said. Irrespective of this standing rule, which bars the Senate leadership from commenting on any matter already at the courts, when Thursday's proceedings began and Ekweremadu called on the Senate Leader, Senator Victor Ndoma-Egba, to introduce the business of the day, he was interrupted by Senator Bukola Saraki (Kwara Central), who raised a point of order, drawing the attention of the Senate to Order 53 of the Senate Standing Rules, stating that his privilege to write a letter to the senate president for the knowledge of the entire parliament had been breached.